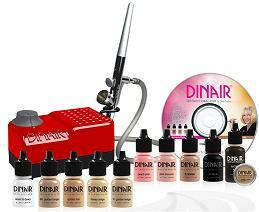 Unlike traditional makeup, Dinair Airbrush Makeup provides flawless coverage by minimizing skin imperfections such as spots, blemishes, and even dark circles. What results is a beautiful natural look that lasts 24 hours without smearing, running, fading, or caking. ““““This kit contains the following:““““4 Foundation Shades, 0.25 oz.““Pro Beauty Airbrush““Black Onyx Pro Compressor Color““Moist & Dewy Moisturizer““Easy to Learn DVD““4 Shades, 0.25 oz.““Designer Stencil Set““Sample Concealer““Facial Tanner, 0.5 oz.““Ingredients: Deionized Water, Talc, Propylene Glycol, Acrylates Octylacrylamide Copolymer, Glycerin, Triethanolamine, Xanthan Gum, Magnesium Aluminum Silicate, Phenoxyethanol, Sodium Benzoate.““““May Contain: (Pigments)““Titanium Dioxide, Iron Oxides, Manganese Violet, Chromium Oxide Green, Aluminum Powder, Bronze Powder.““PLEASE NOTE:THERE ARE ADDITIONAL SHIPPING CHARGES ON THIS PURCHASE OF THIS AIRBRUSH SYSTEM AND DOES OVERIDE OUR FREE SHIPPING POLICY WHICH WILL NOT APPEAR ON YOUR INTERNET ORDER BUT WILL APPEAR ON YOUR ACTUAL INVOICE RECIEVED FROM US.